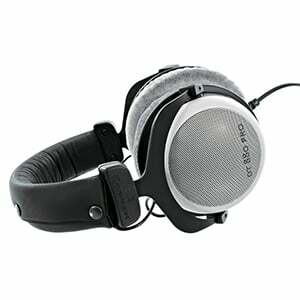 Beyerdynamic is offers a very interesting line of studio headphones. When we say interesting, we mean the type that makes you wonder why they’ve implemented something. Beyerdynamic DT880 PRO are weird, but also among the best studio headphones under $300. Here’s the story behind these and what they can do. Looking at the entire DT series of headphones, a couple of things stand out. To start things off, the frame comes across as overly simplistic, and it is. Beyerdynamic has used the most basic type of headband out there, with ABS forks that look fragile. Mind you, they only look weak but are actually pretty rugged. Let’s put that down as the weird thing no.1 on the board. Padding on the headband is all over the place. On the top, sides and the bottom. With that said, it is fairly thick which translates to good comfort. One of the most defining design solutions on DT880 PRO is the way they did the driver housing. Beyerdynamics went with a semi open design, thus combining the best of both closed back and open back worlds. The impact this decision has on performance is something we will touch upon later. 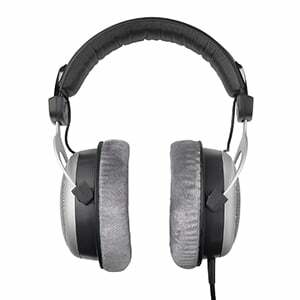 Beyerdynamic is a rare brand that offers all of their headphones in three versions. You have the low impedance one, then there is the 250 Ohm model and the 600 Ohm model. The one we are looking at today is a 250 Ohm unit. We feel that it offers the best platform for proper studio monitoring, since there isn’t much of a difference compared to the 600 Ohm model. Frequency response range goes from 5Hz to 35kHz while the nominal SPL is set at 96 dB. Hardware wise, these headphones are set to go. That is, until you look at the cable. For some reason, Beyerdynamics refuses to offer their headphones in this range, with a detachable cable system. Instead, they only use a fixed design. Seeing how everything else is replaceable on these, it’s weird that Beyerdynamic would decide to limit you to one cable. Performance makes up for the whole cable situations and then some. If you want to see a flat set of studio headphones, all you need to do is check out the response graph for DT880 PRO. They are literally flat until you reach some 7kHz where there is a slight spike. On top of that, there is no ear piercing brightness in the trebles nor thumping bass at the bottom of the range. It is all balanced. In terms of comfort, Bayerdynamics DT880 PRO are great. Nothing beats velour ear pads that fit well and offer proper seal. Speaking of padding, many people had some reservations due to the simple design of the headband, however there is nothing to worry about. The headband is very comfortable and won’t start to trouble you even during prolonged periods of use. Beyerdynamics DT880 PRO are definitely a model suitable for professional use. Beyerdynamics DT880 PRO, even with all of their weirdness, are some of the best studio headphones you can get right now. The performance is impressive with the type of flat response that is rarely seen in their category. On top of that, they are just awesome in terms of comfort. 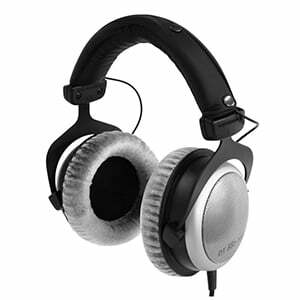 For more info about the Beyerdynamic DT-880 Pro, click here.